Born: 28 July 1795, London, United Kingdom. Died: 13 December 1877, Port Elizabeth, South Africa. John C. Chase, son of George Chase and his wife Elizabeth Matilda Centlivres, became secretary to a British emigration society in 1819. In April 1820 he and his wife, Arabella Broom Elliott, landed at Algoa Bay as members of Bailie's party of British settlers. He was granted land near Uitenhage and between the two Kleinemonde rivers (east of Port Alfred), but his efforts at farming were not successful. He joined the Cape Civil Service as accountant of Albany, stationed at Grahamstown, in 1825, and from December 1826 was vendue-master for the Albany District untill the post was abolished at the end of 1827. He moved to Cape Town in 1830, where he was promoted to a senior position in the customs department. He was also appointed as a special justice under the Slave Emancipation Act in 1834 and admitted as a notary public in 1837. In May 1831 he became a member of the South African Institution, the first general scientific society in southern Africa. In June 1825 Chase and another settler, James Collins, undertook one of the earliest trading expeditions to Klaarwater (Griquatown), the London Missionary Society's station beyond the Orange River. This journey seems to have given rise to his insatiable curiosity relating to the geography and cartography of southern Africa. From that time he actively collected information from all available sources on the exploration of the subcontinent, though he did not participate in further exploratory travels himself. Thus in 1828 he obtained, via H.F. Fynn*, the papers of Dr. Alexander Cowie and the merchant Benjamin Green, who had died during their return from a trading expedition to Delagoa Bay. He also obtained the journal of two traders, Robert Scoon and William McLuckie, who were the first colonists to visit the Matabele Chief Mzilikazi, during their journey from Griqualand West to Mozambique in June to August 1829. His paper on their journey was published in the South African Quarterly Journal (Vol. 1, No. 4, pp. 402-407) in 1830. At this time Chase was collecting information on all travels into the interior undertaken from the Cape of Good Hope. A copy of his sketch map for that work was sent to Viscount Goderich in London in February 1831. The information on this map was included, without Chase's permission, in a map of South Africa published in London in 1834 by the Society for the Diffusion of Useful Knowledge, and thereafter also used by others. Chase objected strongly to this plagiarism. Meanwhile his notes on these travels were published under the title "An account of the progress of geographical discovery in the African continent made from the Cape of Good Hope" in the South African Quaterly Journal (1833-1834, Vol. 2(1); Vol. 2(2), pp. 97-106, 129-137, 161-168; Vol. 2(3), pp. 193-206, 225-232). He also compiled a Map of the eastern frontier of the colony of the Cape of Good Hope, which was published by John Arrosmith in London in October 1836. It included statistical notes on the colony for 1833. A copy of the second edition (1838) of this rare map was donated to the Albany Museum, Grahamstown, in 1899. He submitted to the government a sketch of the mouth of the Great Fish River in 1844, a sketch of the mouth of the Buffalo River in 1846, and a plan of the harbour of Algoa Bay in 1868. Chase was elected a member of the council of the South African Literary and Scientific Institution (founded in Cape Town, 1832) in July 1833. He was joint secretary of the Institution from 1835 to 1838, and a member of its Statistical Committee. He was also involved in founding the Cape of Good Hope Association for the Exploration of Central Africa in Cape Town in 1833, by members of the South African Literary and Scientific Institution, to organise and finance an expedition, led by the zoologist Dr. Andrew Smith*, to explore the interior of southern Africa. Chase was a member of the provisional committee charged with establishing the association, and was joint secretary of the Association during its early years. He was also secretary of the committee that drew up the instructions for the expedition in June 1834, and was re-elected as a member of the Association's new management committee in 1836. He remained a member of the committee to about 1848. Already in September 1833 he had produced a map of the whole of southern Africa up to the equator, for the use of the expedition. It was up to date and showed the routes of many former travellers. Areas about which nothing was known, including most of present Namibia, Zimbabwe, and Lesotho, were blacked out. Chase left the public service in 1835 and became a leading figure at the commercial exchange in Cape Town. In 1837 he returned to the Eastern Cape to become a partner in the whaling and sheepfarming business of Frederik Korsten, near Port Elizabeth. 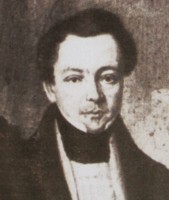 He married Korsten's daughter, Maria Johanna Charlotta Korsten, as his second wife, following the death of his first wife in August 1830. As a notary and merchant he was a leading citizen of Port Elizabeth for the next ten years. In 1843 he published an important historical work in Grahamstown and Cape Town: The Natal papers; a reprint of all notices and public documents connected with that territory, including a description of the country, and a history of events from its discovery in 1488.... Another work of his, published in London the same year, was The Cape of Good Hope and the Eastern Province of Algoa Bay..., which was edited in London to support an emigration scheme. The map accompanying this work showed the routes of several explorers, including that of Piet Retief to Dingane's Kraal. Curiously none of Chase's maps show any of the exploratory travels of Dr. Andrew Smith, and it seems that the two did not see eye to eye. Cape of Good Hope annual register, directory and almanac... (title varies). Cape Town, 1834-1848. Cape of Good Hope Association for the Exploration of Central Africa. (1) Instructions for the expedition into central Africa from the Cape of Good Hope. Cape Town, 23 June 1834. (2) Prospectus of a plan for an expedition into Central Africa. Cape Town, 1833. (One page document, in South African bound pamphlets, Vol. 4, National Library, Cape Town). (3) Abstracts of proceedings drawn up for publication by direction of the managing committee of the Cape of Good Hope Association for Exploring Central Africa. Cape Town, 1833. (4) Proceedings of a general meeting of the members of the Association held on the 19th March 1836.... (In South African bound pamphlets, Vol. 4, National Library, Cape Town). Cape of Good Hope. Report of the committee of the Albany Museum, 1899, p. 13. National Automated Archival Information Retrieval System (NAAIRS). http://www.national.archives.gov.za/naairs.htm Documents relating to John Centlivres Chase / John C. Chase / J.C. Chase. South African Commercial Advertiser, 15 June 1833, p. 1, Prospectus of a plan for an expedition into Central Africa; 20 July 1833, p. 2, South African Literary and Scientific Institution; 10 February 1836, p. 1, advertissement; 30 March 1836, p. 1, Central Africa. South African Quarterly Journal, 1829-1834, Vol. 1-2.